We are Hereford's only firework specialist and work closely with Radway Bridge Garden Centre. 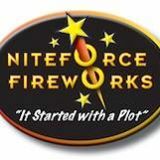 Niteforce Fireworks stock a vast range of fireworks for sale at great prices, we also have many special offers during peak seasons. From Spinning Wheels to Fountains and Mines, Barrages and Cakes to Candles, plus many different firework display packs at discounted prices and not forgetting our range of amazing Rockets. We also have a wide variety of supplementary products including Chinese flying lanterns, wax processional torches, indoor fireworks and indoor ice fountains. To view our extensive collection, visit Niteforce today! Living Landscapes have been trading since 1989. We are based just outside Newent, Gloucestershire, not far from the Herefordshire border. Many of our projects are carried out within the counties of Gloucestershire, Herefordshire and Worcestershire, but we are happy to travel to wherever our services are required. Specializing in all aspects of design, construction and maintenance, we offer a competent, friendly service, and we pride ourselves on tidy working. We offer a complete service. All aspects of landscaping are within our remit. A large proportion of our work is in private gardens, but we also undertake projects and carry out landscape maintenance for local councils, schools, and other public bodies. The Pet Shed have a large range of products for your pet - From dogs and cats to ferrets and fish. We are Aquatics specialists. We can deliver bulk items locally and also in the Newent area. The one-stop shop for landscape materials, water gardening and aquatics. The Watershed Paving and Aquatics Centre opened at Radway Bridge Nurseries just before Easter 2010. Our aquatics section stocks everything you would need to create and maintain a garden pond. We also stock probably the widest selection of water features and fountains in the area. We also supply a wide range of landscaping materials from paving and walling, gravels and aggregates, through to greenhouses, sheds and garden buildings. Visit our website and facebook page today!